While the racers approach 133mph, our SV is more cruise than missile. 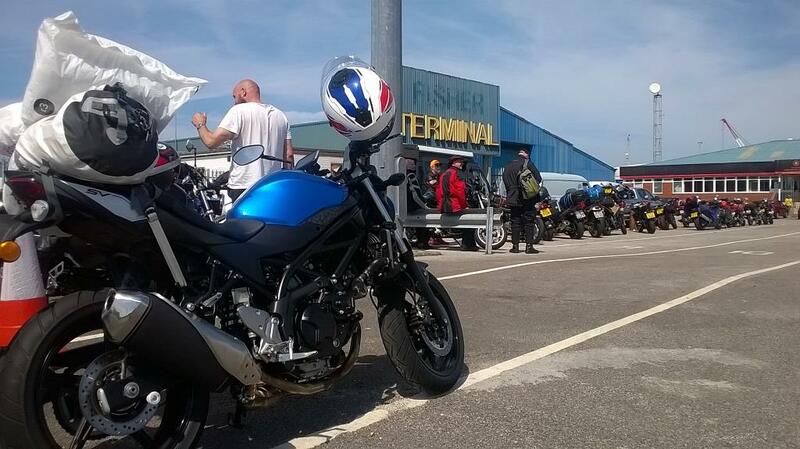 My longest day yet on our Suzuki SV650 long-term test bike turned out to be a belter. Up and at em at 6.30am to give myself plenty of time to get from Lincolnshire to Heysham in Lancashire for the 2.15 sailing on Ben My Chree to the Isle of Man TT. For once I was organised and the bike was already packed the night before with my clobber for three and a half days on the Island, including an airbed and sleeping bag. The SV isn’t an ideal luggage mule with its small rear seat and few mounting points, so I had to ditch my trusty and simple Ortlieb rollbag in favour of a more bike-focused Oxford Aqua T50. The yellow Ortlieb has been with me for so many adventures over 11 years that I felt oddly disloyal for leaving it at home, but the Oxford’s velcro underseat security strap and D-ring lashing system made it a better choice. The SV’s suspension is already stretching dealing with the weight of a 15-stone rider so I needed the luggage to be a steady load to avoid compounding the problem. Putting anything heavy in the centre of the bag, so it could be supported by the bike’s seat, helped with stability on the move. Leaving myself six hours to cover a journey that should take no more than four was a rare piece of preparation. And it meant I could appreciate the journey rather than spending it stressing about making my crossing. The first section of rolling roads through Leicestershire and Nottinghamshire, then a leisurely cruise along the A50 to the M6 was perfectly pleasant. I never topped 80mph and there wasn’t a single sign of neckache from a bike that wouldn’t normally be associated with touring. An 85-mile stretch of M6 followed and I kept speeds similarly restrained, with loads of time in hand. I was looking out for discomfort from the seat as one of my reader contacts who owns an SV, Geoff McManus, is struggling to stay in place on the seat. But the rollbag on my pillion seat and small rucksack sandwiched in between meant little room to slide around, so perhaps I was lucky that it put me in the right position for a long stint. As I cruised up the M6 I was glad of the time cushion I’d left myself, with a police patrol tucked behind a grassy embankment that would easily have mopped me up if I’d been pushing along with a booking-in deadline looming. I felt similarly grateful when passing a second patrol on the final run from Lancaster to Heysham. I arrived in enough time to check in – for the crossing before mine. That’s never happened to me before. It gave me plenty of time to chat to the people around me in the queue. And that’s where I met Bob. I didn’t ask for Bob’s surname because it felt too formal. This wasn’t an MCN interview, this was a meeting of two bikers that I’m glad occurred. Bob is from Southampton and this is his first trip to the Isle of Man TT, having snapped up a late opportunity to buy up a friend’s ferry crossing and hotel digs. Bob rides a BMW R1200R. And Bob is 82 years old. 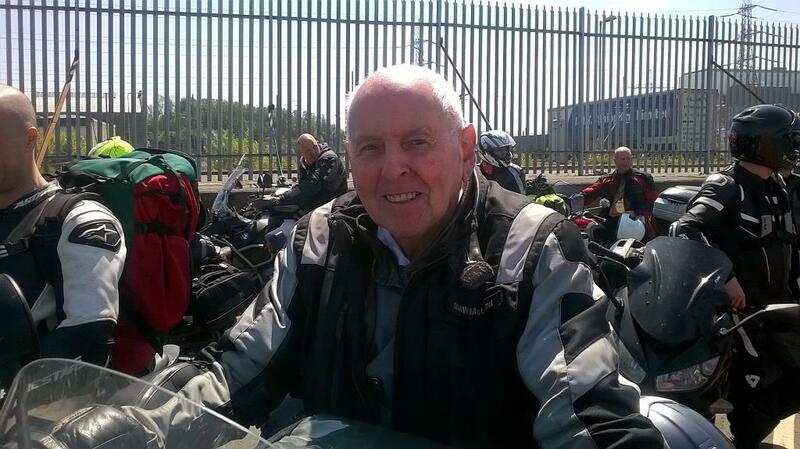 He says this is another item that he’s ticking off his bucket list as he’s taking his motorcycling one year at a time. Next month he’s riding to Slovakia and he says he’s getting towards the end of his list. If you’re reading this and you know Bob, please tell him I’m glad to have met him. After the typically bustling ferry embarkation with hundreds of bikes being roped into position, the crossing was the smoothest I’ve known across any kind of sea. The Irish Sea was as calm as my ride to Heysham, and the three and a half hours on the Steam Packet ferry went by in a flash. For the last hour the silhouette of the Island grew larger and tantalisingly closer, then Ben spun gently round and nudged into position before spilling her load of two-wheeled tourists onto the streets of Douglas. It’s four years since I’ve been to the Island in TT week and the festival atmosphere along Douglas promenade sweeps through me within seconds of leaving the boat and aiming for my digs. I’ve got a spot on a floor in Hildesley Road, just off Bray Hill, for the next few days and the sat-nav points me around the streets until I find it. The final practice is due to start any minute and as I roll the SV’s back wheel against the kerb I hear the sound of a screaming engine at the end of the road. It makes me jump. It always does. Practice has started and the fast boys are screaming along the end of my road. I wander along and join my mate Keith and introduce myself to his friends Pat and Mark. They give me an earpiece so I can listen as Ian Hutchinson sets an unofficial lap record of 132.8mph on his superstock BMW S1000RR. The place is buzzing and so am I.
It’s now 8am on Saturday and the superbike race goes off in three hours’ time. Pat, who’s been coming to the Island since 1978, is leading us to a vantage point out at Cronk-y-Voddy and I’m looking forward to cruising round the first part of the section, before the roads close, to get there. The Isle of Man TT has always been too much of a rush for me on previous visits, but this time I’m on holiday and it feels perfectly chilled out. And the no-pressure SV650 played a big part in that.